Upon learning that the final two episodes of Adventure Time’s penultimate season were titled “Preboot” and “Reboot,” I began to worry that this show would hit the reset button going into its final season. Thankfully, that’s not the case. I’d hate for this series to wipe away all the progress it’s made since its humble beginnings as a goofy, simple cartoon about a young boy and his magical dog, and instead of starting fresh, these two episodes continue to push the overarching narrative forward while delving deeper into the show’s mythology. The reboot of these episodes concerns Susan Strong, whose cybernetic implant (revealed back in season 6’s “Dark Purple”) is activated this week, rewiring her brain so that she’s fixated on bringing a specific target, Finn, to an unknown location. “Preboot” sets up this awakening with the introduction of Dr. Gross, a “human-plus” scientist outfitted with all kinds of cool cybernetic mods. “Preboot” is a showcase for this show’s design team, taking the characters into a sleek new sci-fi environment filled with hybrid animals who have been cybernetically modified. The character designers in particular get to have a lot of fun as they create the initial hybrid designs and then give those a cybernetic upgrade when Dr. Gross puts her creations in attack mode. As she introduces Finn, Jake, and Susan to her menagerie, Dr. Gross sings a song that plays a bit like a synthwave “Pure Imagination,” introducing the group to a world of wondrous evolution with a sinister undercurrent. Gene Wilder’s performance brought that unease to Willy Wonka’s song, but it’s the visuals that make Dr. Gross’ tune ominous and disquieting. There’s a hint of mania in Lennon Parham’s singing, and the design of the Dr. Gross’s protective suit gives her an inexpressive, alien appearance that implies a detachment from the rest of the world. The line, “Science has made you more special with just a little help,” is accompanied by a shot of Dr. Gross and company standing in the doorway of the menagerie, and that image of the four of them surrounded by darkness foreshadows Dr. Gross’s villainous turn later in the episode. There’s something spooky going on here, and that spooky something is cybergenetic experimentation run amok. As Finn, Jake, and Susan escape Dr. Gross’ base, the scientist shouts to Susan, “Aren’t you curious about how I know you?” It’s one of the big questions introduced by “Preboot,” and the arrival of Dr. Gross sets up new narrative territory to explore in the final season as the creative team finally delves into what happened to all the humans after the Great Mushroom War. Dr. Gross isn’t operating on her own, and I expect we’ll be learning much more about her and her larger mission in the final season. While “Preboot” is a design spotlight, “Reboot” is an action spotlight, with writers and storyboard artists Tom Herpich and Steve Wolfhard delivering some great fight sequences when a rewired Susan tries to forcefully transport Finn. There are two specific sequences that really caught my attention. 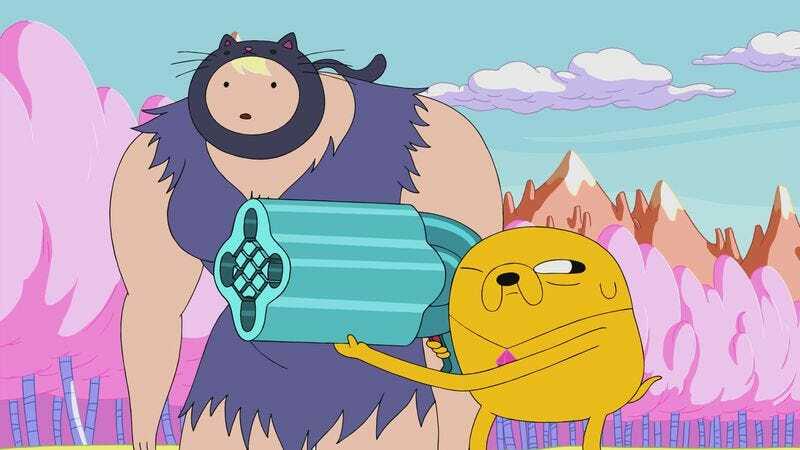 The first comes when Finn is trying to prevent Jake from squashing Susan under his gigantic foot: In one sustained shot, Finn is absorbed into Jake’s foot, travels through his body and emerges out the top wearing the Jake suit, which forces Jake’s body to shrink down as the shot pulls out to show the extreme height from which Finn and Jake are about to perform a body slam. The massive change in scale over the course of the shot gives the moment extra dramatic effect, and the smoothness of this action shows how in sync Finn and Jake are as combat partners. The second moment is another sustained shot, but it’s less focused on dynamism, presenting Finn-Jake and Susan’s battle from a side angle that makes it look like a 2-D fighting game. 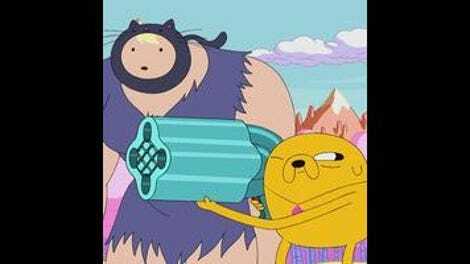 The shot emphasizes how small Finn-Jake is in comparison to its hulked-out opponent, and the storyboards create a stronger sense of the effort all parties are putting into the fight by resisting more kinetic angles and cuts. I’ve often mentioned how this show’s cast is reminiscent of The Simpsons in just how expansive it is, and these episodes check in on a variety of auxiliary cast members that haven’t been seen for a while. Tiffany returns as Cyber-Tiffany to introduce Finn, Jake, and Susan to Dr. Gross in “Preboot,” and “Reboot” features the return of the Candy Kingdom’s protector Rattleballs (and his tragic destruction at Susan’s hands and foot) and a cameo from Sparkle, the baby BMO returned to his mother in “BMO Lost”, who has grown up and befriended the horse James Baxter. The sprawl of this series after seven seasons is the main reason why I was nervous about a potential reboot, and I’m excited to see which faces will be returning for the final season. The final moments of “Reboot” awaken Susan from her programming, but a mysterious new threat emerges when the Grass Sword merges with the Finn Sword, creating a humanoid plant being with connections to dark forces. The season finale cuts off with a shot of this new figure, establishing it as a major new presence in the series while leaving readers with plenty of questions to be answered in the future. Who is this new creature born from the union of Finn’s weapons? What is the creepy tentacled being that replaces Finn inside the Finn Sword? Where did that transmission from Susan Strong end up, and who lives in that dark room? How is all of this connected to Dr. Gross? There’s no set premiere date for the final season yet, but hopefully we won’t have to wait to long to get the answers to these questions. Episodic Adventure Time reviews are back on T.V. Club, thanks to the enthusiastic support from you, our darling readers. You guys rock! I love when this show interacts with the Earth before Ooo, like the opening scene of “Preboot” that has Finn, Jake, and Susan exploring the ruins of an old arcade. Did you know that prehistoric horse were covered in feathers and used their poles to sting people who tried to steal their honey? The evolution of human mods: glasses, pacemakers, scissorhands, telescopic spider-legs. Dr. Gross’ crocodile/octopus doesn’t have a formal hybrid name, but it has to be Croctopus right? Do not give Jake a gun because he has horrible aim. The scene of him hitting birds and trees over and over again is very funny, especially when he tries one last time to hit his intended target and hits another bird and tree. Does Dr. Gross’s gun shoot out the plastic rings that six-packs come in? It looks like it. I’ve never noticed the Candy Kingdom’s pretzel gate before. I love that even the most familiar environments still surprise me on this series. “Geez, I did my warning dance and everything.” Use your words, Scorpmunk!